The Algarve is possibly one of the most famous golfing regions in Europe, and is certain to give you that perfect holiday by the greens. Fly to Faro with Thomson in May and you will receive free golf club carriage. Simply make your booking online and then call Thomson’s dedicated phone line to add on your free golf carriage (0871 231 5945). Scattered with expertly designed golf courses, the Algarve is the place to head to if you want to perfect your pitch and putt. 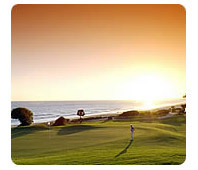 The area is renowned for golf courses, so you simply can't go wrong when it comes to golf holidays in the Algarve. Golfers come back here year after year, and it’s easy to see why. For a start, some of the world’s finest championship golf courses are within easy reach. From the beautiful lakes and waterfalls of Victoria Course - suitable for all handicap levels - to Vila Sol which has hosted the Portuguese Open, you’ll find something to challenge your game in glorious surroundings. Thomson has literally thousands of customers who choose to fly to Portugal every year and with the added incentive of free golf carriage, there is no better time to fly. To take advantage of this amazing offer and guarantee a space within the aircraft hold for your equipment, you need to pre-book your item. The Thomson aircraft hold is limited and they have a restriction on the amount of equipment that can be accommodated. If you do not pre-book, Thomson will only accept your equipment if there is sufficient room in the aircraft hold and you will have to pay the appropriate fee at the airport. Make sure to secure your golf clubs and other sports equipment - Thomson recommend that zipper type compartments are padlocked. The transport of individual golf clubs as hand baggage is not permitted. If you wish to carry just one or two clubs, Thomson recommends that they are protected in a padded box for carriage in the hold of the aircraft. Thomson recommends that passengers have insurance cover for the replacement value of all their sports equipment. Please note that your clubs must be added to your flight booking at least 3 days in advance of your departure date.